One of my good friends was recently celebrating her birthday and we held a wine and cheese party for just the girls at my place. I wanted to make something light, pretty and girly and this Pink Champagne Cake from Booze Cakes looked like just the thing. The consistency of the cake is between a regular white cake and Angel Food cake, and the champagne gives it this slight strawberry flavoring. I had picked up some white and red raspberries at the farmer's market that morning and ended up decorating the cake with it. It's the perfect dessert to make for your mom, your best girl friend, lush lady or future bride. - Preheat oven to 350, and grease two 9-inch round cake pans. - In a bowl, combine flour, baking powder, salt and set aside. - In a mixing bowl, beat butter and sugar for 3-5 minutes or until fluffy. - Add vanilla and beat in egg whites one at a time. - Mix in food coloring (optional). - Beat in flour mixture and champagne in 3 alternating additions so the mixture doesn't curdle. - Pour batter into 2 pans and bake for 35 minutes. - Beat the butter in a mixing bowl for about 1 minute. - Add the confectioners sugar and champagne in alternating additions. - Mix in milk, vanilla and food coloring. - When cake has completely cooled, put one piece on a cake plate and spread a nice, thick layer of frosting on top. - Add the second cake layer and cover entirely with frosting. 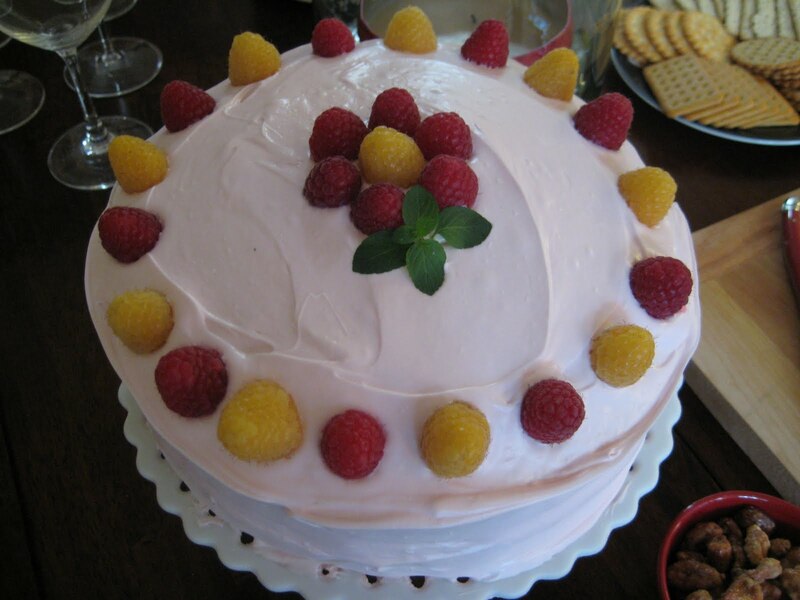 - Garnish with raspberries or strawberries.